No matter how much time you spend in Madrid, you'll never be bored. With world-class museums, grandiose architecture, and diverse dining scene, it's full of places to be and things to do. At the same time, this wealth of attractions and activities comes with Spain's famously laid-back lifestyle, so there's no pressure to see or do it all at once. And if 18 things aren't enough, be sure to check out our master list of 100 things to do in Madrid for more ideas. Any art aficionado visiting Madrid knows that the Reina Sofia Museum forms part of the prestigious Golden Triangle of Art. The massive complex houses one of the world's premier collections of art from the 20th century, including big names like Picasso (don't miss Guernica), Dalí, and Miró. Get your tickets on their website for a small discount. Spain's nightlife is legendary, to say the least. The two big discotecas in Madrid are Kapital and Joy Eslava, but they're not the end-all-be-all of nightlife. The trendy Malasaña neighborhood is home to some great clubs that often give you more bang for your buck. 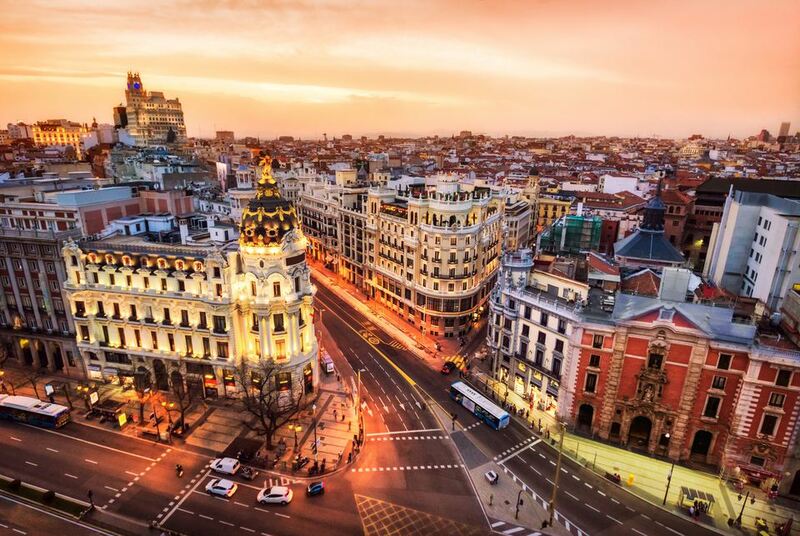 Madrid's central location combined with Spain's excellent intercity public transportation network make the capital an ideal home base for exploring the rest of Spain. Cultural Toledo, sunny Cordoba, medieval Ávila and more are all just a quick train ride away. Start planning your ideal day trip from Madrid and get ready for an adventure that you'll remember for years to come. Every city in Spain has a main square that forms the centerpiece of daily life for both locals and visitors. Here in Madrid, that square is Plaza Mayor, one of the most ornate and grandiose examples of architecture in the city. The restaurant and cafes with terraces that spill out onto the square are on the touristy side, but their indisputable charm helps add to its appeal. Even if you're not a soccer fan, you've likely heard of Real Madrid. As one of Spain's most legendary teams, it comes as no surprise that their home turf—Santiago Bernabéu Staidium—is one of the top things to see in Madrid. If you're in town during soccer season, you absolutely can't miss the once-in-a-lifetime opportunity to watch this iconic club take the field, but get your tickets ASAP. In the off season, it's still possible to experience the magic of Real Madrid by taking a tour of the stadium. While it may seem like the center of life in Madrid is the area around Gran Vía and Puerta del Sol, you'll find that getting off the beaten path can give you a more authentic glimpse of life in the city. In this case, you don't even have to go very far. From the multicultural spirit of Lavapiés to the buzzing tapas joints in La Latina to the literary history that lines the streets of charming Huertas, there are whole worlds within reach of Madrid's central hub. The heavenly combo of churros and chocolate is one of the most famous examples of Spanish cuisine many visitors may know, and for good reason. While locals often enjoy churros for breakfast, they also make a great mid-afternoon (merienda) or late-night snack. When it comes to where to eat churros in Madrid, you're spoiled for choice. One of the most popular spots is Chocolatería San Ginés near Plaza Mayor, but its fame often brings long lines and big crowds. Head to Chocolat in Huertas for equally delicious churros in a more relaxed environment. If the Reina Sofia is the foremost center of modern art in Madrid, then the Prado is the equivalent when it comes to the classics. Here, stunning masterpieces such as Las Meninas by Velázquez, Goya's Black Paintings, and an unmissable selection of works by El Greco are obvious standouts, but every single one of its 7000+ pieces is worth seeing. Get your tickets online before you go to avoid lines at the box office. Madrid is one of Europe's greenest capitals, with dozens of gorgeous parks and gardens just waiting to be explored. If you only have time to visit one, though, make it Retiro. As the most famous of the city's green spaces, it boasts a picturesque manmade lake, a lovely rose garden, a glimmering crystal palace filled with artistic installations, and more. Everyone thinks they know what tapas are (small plates from Spain! ), and while that definition is generally true, tapas are so much more than just food. Here in Spain, they're a social experience and a way of life. Tapas are all about getting together with good friends to share plates and conversation, often moving from bar to bar along the way. Check out a traditional joint like Casa Labra or La Casa del Abuelo, or go modern at a place like La Palma 60. The Chamberí metro station no longer serves passengers, but remains frozen in time. After closing in the 1960s, it became abandoned for several decades until a restoration project brought it to new life. Today, it looks much the same as it did in the 1920s, with glamorous vintage advertisements and old-fashioned turnstiles. It's a fascinating way to experience a bit of the glamorous Madrid of the past, and best of all, it's free. A real Ancient Egyptian temple in the heart of Spain's capital? Yes, you read that right. The Temple of Debod was moved brick by brick from Egypt to Madrid in the 1960s, and today stands as one of the city's most unique sights. Its location in Parque del Oeste is just down the street from the Royal Palace, and it provides one of the most stunning sunset views in Madrid. Look down as you pass the old Royal Post Office in Puerta del Sol and you'll see an unassuming metallic plaque. This is Kilometer 0, which marks the geographic center of Spain and the point from which all major roads begin. As you stand in the heart of the country, look up at the clock on the post office building, too—it's said to be official source of time in mainland Spain. Spain's royal family may not actually call the Royal Palace home, but their official residence is still worth a visit. Get your ticket online and show up to experience the marvelous opulence of this jaw-dropping 18th century building. Entry also includes a visit to the Royal Armory, an impressive collection of royal armor and weapons dating from the 13th century. You don't need us to tell you that Madrid is one of Europe's trendiest fashion capitals. From the glitzy international designers in chic Salamanca to the funky boutiques in Chueca and even the big-name global brands on Gran Vía, you'll be able to find your perfect shopping district here in Madrid no matter what your heart desires. Bonus points if you come during the semi-annual sales period (rebajas). Market halls are where madrileños do their grocery shopping, catch up with friends and neighbors, and even grab a bite or a drink at the market bar. These colorful centerpieces of daily life are a great way to live like a local while in Madrid. The Mercado de San Miguel is the city's most famous, but for a less touristy experience, consider Mercado de la Paz or Mercado de Antón Martín. Madrid looks even better when seen from up above. Head up to the top of the Circulo de Bellas Artes building to access its iconic rooftop—you'll have to pay a small entrance fee, but it's well worth it for the awe-inspiring, sweeping views of central Madrid as well as the fabulous mixed drinks and good vibes. Want to go all out when it comes to experiencing Madrid's dining scene? The world's oldest restaurant is calling your name. Botín has been going strong since 1725, was name-dropped by Ernest Hemingway, and serves the best roast suckling pig this side of Segovia. Just don't forget the wine.